"A faded appearance combined with cutting-edge technology. A vintage look matched by avant-garde energy. The C1 Vintage chronograph plays with paradoxes through a bold stylistic exercise reflecting Concord's unique approach to mechanical engineering. Sporty and retro, deliberately aged and decidedly muscular, the timepiece radiates a powerful dynamic that accentuates the performances of its COSC-certified automatic movement. To achieve this faded look, the PVD-treated stainless steel case has undergone a mechanical and chemical polishing process known as Trowalising® or barrel finishing. After being placed in a vibrating drum with deburring chips, water and a detergent compound, it was subjected to over two hours of intensive friction and rotation. The vibrating and abrasive effect subtly eroded and shotblasted the surface and its edges in order to create an authentic matt-type finish. The contrasting materials further enhance the rugged temperament of the chronograph. The rubber-clad ring surrounding the case middle – a signature feature of Concord watch construction – highlights the texture of the case. The pushers and elements overlapping the faded bezel accentuate the visual effect, while the crown and dial feature alternating finishes expressing the same provocative, contradictory spirit. 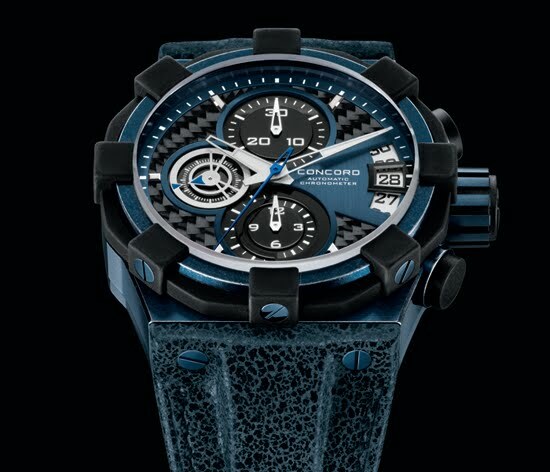 The strap has been chosen to match the case, since the blue leather has been deliberately worked to create a wornout effect counterbalanced by a contemporary black PVD-treated buckle. The resulting total look offers a resolutely offbeat vision of time, oscillating between past and present with disarming ease."